Hey, Chickie, Chickie...you're one in a dozen! Hey, Chick! stamp set from Stampin' Up! Yet another Hey, Chick card. This one uses the Hexagon Dynamic Textured Impressions Embossing Folder. It is extra thick and depending on which side of the embossing folder you use, it can either look like chicken wire or it can look very masculine like nuts and bolts. 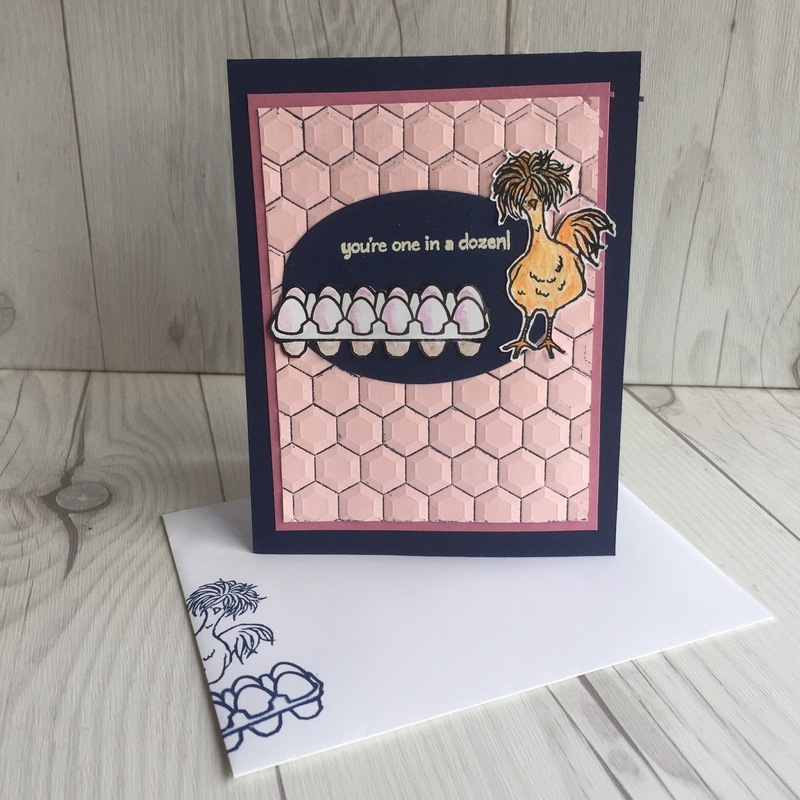 I chose some unusual color combinations for this card, but as I work through my Easter projects, I think they'll make sense. I'm using Night of Navy, Sweet Sugarplum and Pink Pirouette. I love this mop topped hen. This card also uses an image from a second set; the Perfect Mix set. The "You're one in a dozen!" sentiment is from that set as well. The embossing folder was brayered with Night of Navy before rolling the Pink Pirouette background through the Big Shot. I also added a couple of stamped elements to the envelope. The hen was colored with watercolor pencils and then a blender pen was used to blend the colors. The sentiment was embossed onto the Night of Navy background. The original layout from this card was CASED from Understand Blue. The Hey Chick set is one of the stamp sets you can only get as a free selection with a $50 order and only during Sale-A-Bration. The extra sign-up bonuses during Sale-A-Bration make this the best time of the year to sign up as a demonstrator. Sign up as a demonstrator for $99 and get $125 in merchandise that YOU select plus an additional 2 free stamp sets. Pick stamps that fit your stamping or scrapbooking style. Your kit also includes business supplies, catalogs. And your starter kit ships free! If your next order is over $99, this is a great way to fill your Occasion catalog wish list and get future purchases at demo discount prices. Live OnStage regional events, to see new products, meet new friends, and see old friends. Many demos have been stamping together 5, 10 or 15+ years.